• At 9:45 AM ET, Chicago Purchasing Managers Index for December. The consensus is for a reading of 61.8, down from 63.9 in November. The Case-Shiller house price indexes for October were released on Tuesday. Zillow forecasts Case-Shiller a month early, and I like to check the Zillow forecasts since they have been pretty close. The last few months of 2017 have clearly demonstrated the extent to which the housing market refuses to be knocked off its stride. Sales of existing homes have risen strongly and unexpectedly, despite a severe and worsening shortage of homes actually available to buy. To cope, buyers simply linger longer on the market, even into the slower winter months if needed. The Case-Shiller National Index of home prices for October climbed 6.2 percent year-over-year, while its gain from September was 0.7 percent. The 10-City Composite Index increased 6.0 percent year-over-year and 0.7 percent from September, while the 20-City Composite Index grew 6.4 percent year-over-year and 0.7 percent from September. Seattle, Las Vegas and San Diego continued to post the strongest annual gains among the 20 cities, with increases of 12.7 percent, 10.2 percent and 8.1 percent, respectively. Home builders have managed to start construction on more homes than at any point since prior to the recession, despite high and rising land, labor and materials costs. An economy that keeps adding jobs and wages that continue to grow both have consumers feeling confident. And they’re boosted by mortgage interest rates that remain near all-time lows, defying expectations and conventional wisdom alike that both say – and have been saying for years – that rates have to begin rising at some point. 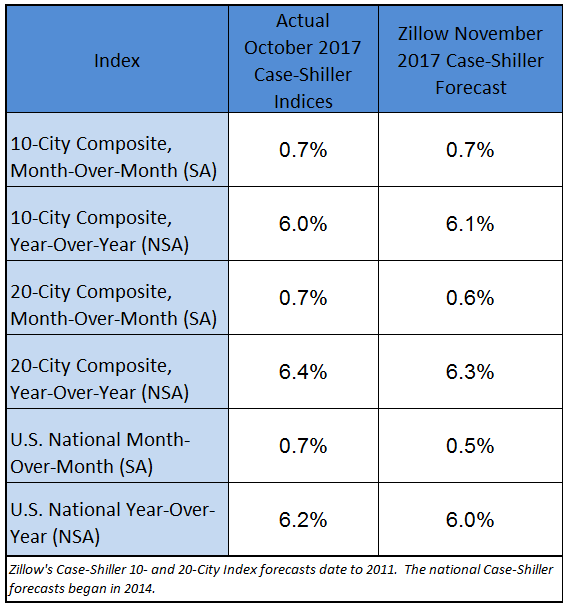 The Zillow forecast is for the year-over-year change for the Case-Shiller National index to be smaller in November than in October. 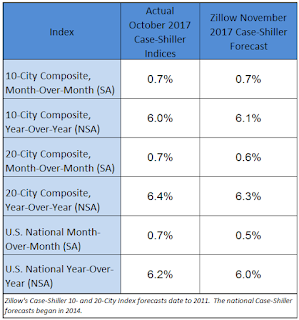 Zillow is forecasting a larger year-over-year increase for the 10-city index, and a smaller increase for the 20-city index in November.